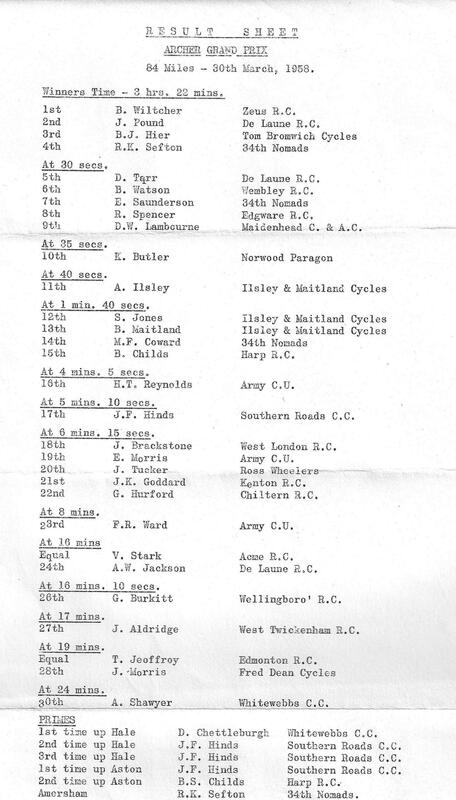 Ken Beck,the archivist and club secretary of the Southport RCC, has sent me this result sheet from the Bath Road 100 mile time trial in 1952. 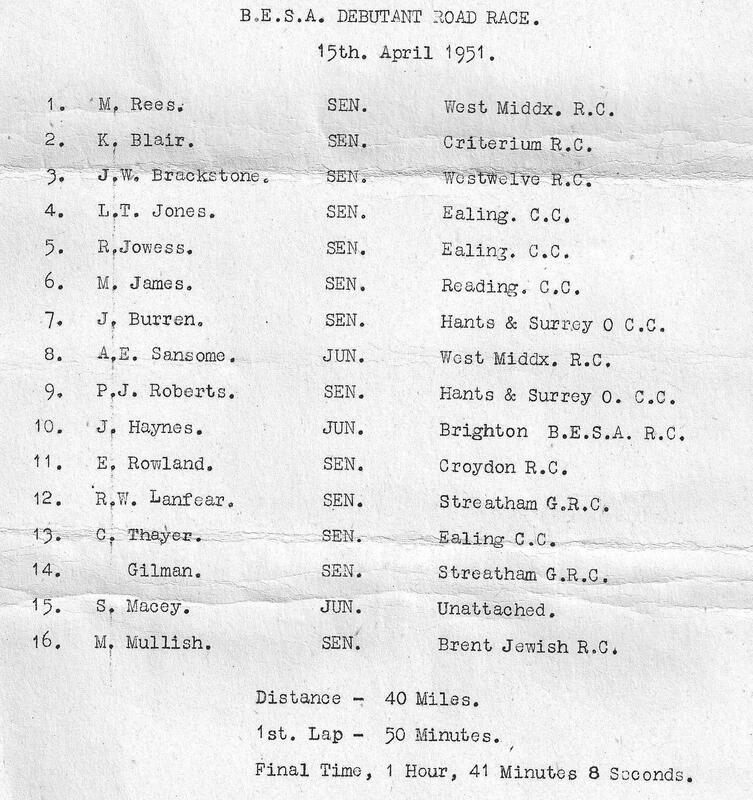 It was among the papers of the late Bob Bird who finished in tenth place. Not many names I recognise although I know Vic Gibbons was a big hitter back then. In fifteenth place is Billy McAteer from the famous Birkenhead boxing family. That same year Billy teamed up with Bob Bird to take the Liverpool to London tandem record, that had stood for eighteen years, by just one minute! It is a surprise to see top roadman Fred Krebs one place behind Billy as I have never before seen Krebs in a time trial result. click on result sheet to enlarge. After hearing about this race from Gino Goddard I now have the result. Sadly I don’t have the stage results but my recollection is that Joe Christison murdered the field on stage two. Plenty of names I recognise. 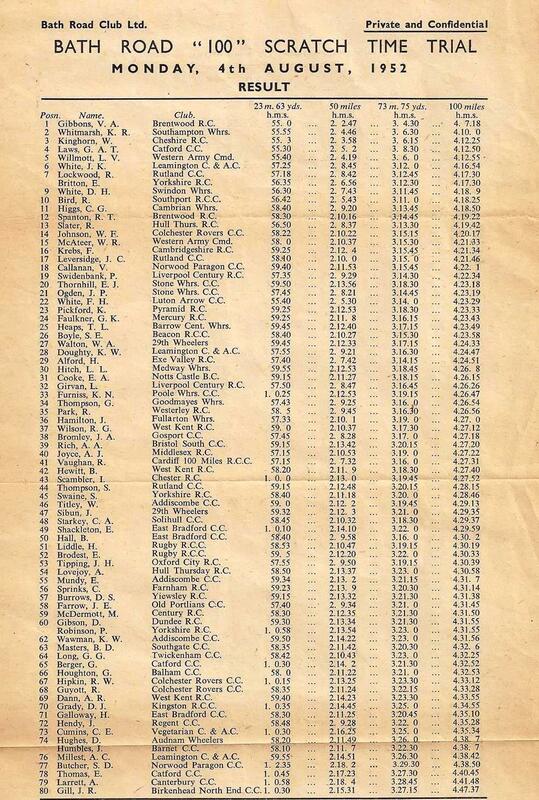 BLRC London Section championship 1951? Not a good ride by Bracky who was half an hour down. 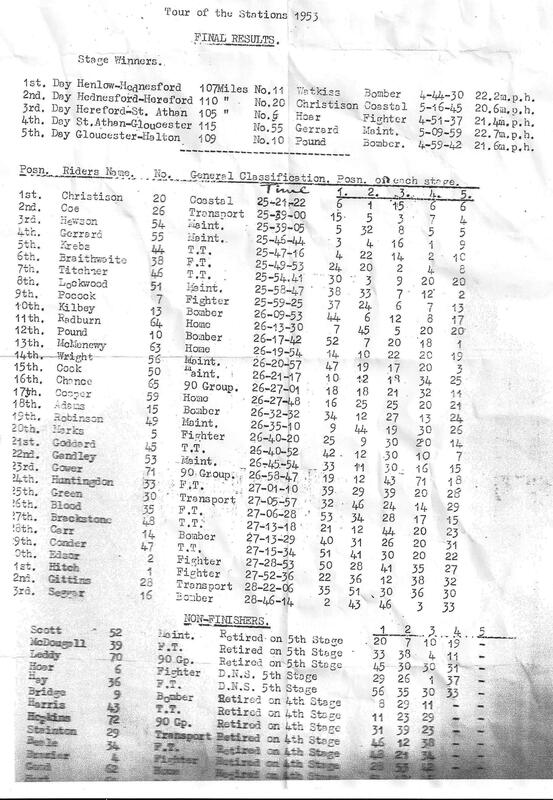 I think it is 1951 as that seems to be the only year that the Dayton team was run. Not many names I know although I am fairly sure Alan Lancaster ran a pub near Burnham Beeches. This is the 1958 race. Frank Evans, Manchester Velo is fourth. I see Frank twice a year in Mallorca where he still gets a few in. Note the team prize is “Prix De L’Equipe”-pretentious twats! A third place for Bracky in this chipper. I guess that fifth place is Ron Jowers as he was in the Ealing CC early in his career. They both later joined the West London R.C. where Ron was Bracky’s lead out man. I recently came across a query about the Brent Jewish R.C. (see last man) but I can’t recall the details. Plenty of names to ponder here. Interesting to see Bob Spencer well up as I didn’t know he raced at this level. Although I have ridden with him in West London the only long ride I have done with Bob was the Bill Bradley Memorial starting from Southport, Lancs. Alan Jackson is well down at sixteen minutes.